Are You Informed Enough to Make the Right Decisions? 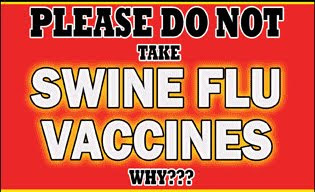 Did you know that swine flu vaccines are untested and dangerous? Did you know that these vaccines contain lethal chemicals, such as mercury, aluminum, roach powder, and disease-causing microorganisms? Did you know that drug companies and health agencies will not accept blame for any injuries or deaths caused by these vaccines? Did you know that the government plans to force you and your children to receive swine flu vaccines, against your will and Constitutional Rights? 11:00 AM – 3:00 P.M.